The Nursery Jaws® features a hydraulically expanding pivot point that allows you to handle a variety of material. 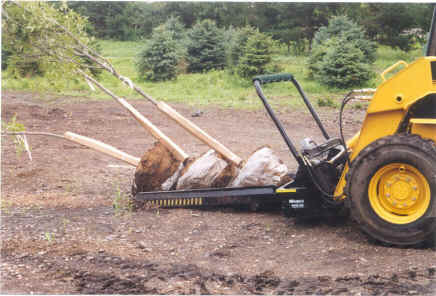 The Nursery Jaws® 2's versatility allows you to move multiple B&B and different sizes of tree balls at the same time. 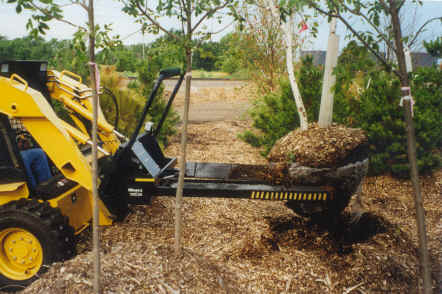 Different degrees of pitch for the forks are available for the perfect grip to move containerized and boxed trees. The Nursery Jaws® 2 will provide years of invaluable service to your business. Move wooden boxes up to 36"
"I purchased my first set of Nursery Jaws® 2 in 2003 to use on my Kubota R-420. WOW! I can't believe I waited so long! 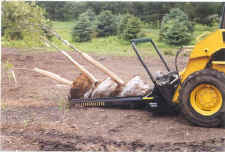 The Nursery Jaws® 2 allowed me to eliminate one man on the truck for unloads and greatly minimized the physical demands of unloading trees with traditional forks. It dramatically decreased my offload times. Trunk and ball damage that can occur with forks becomes non-existent. The ability to adjust the pivot point on the Nursery Jaws® 2 has allowed me to carry larger caliper trees which would have been a nightmare with traditional forks. My second set of Nursery Jaws® 2 arrived for my new Kubota R-520. With two sets of Nursery Jaws® at my disposal, I chuckle in anticipation of the Spring shipping blitz."